2 and depending on the definition used, one of the 20 to 80 essential human nutrients. Insufficient niacin in the diet can cause nausea, skin and mouth lesions, anemia, headaches, and tiredness. Chronic niacin deficiency leads to a disease called pellagra. The lack of niacin may also be observed in pandemic deficiency disease, which is caused by a lack of five crucial vitamins (niacin, vitamin C, thiamin, vitamin D, and vitamin A) and is usually found in areas of widespread poverty and malnutrition. Niacin has not been found to be useful in decreasing the risk of cardiovascular disease in those already on a statin but appears to be effective in those not taking a statin. ^ "Niacin". DrugBank: a knowledgebase for drugs, drug actions and drug targets. Retrieved 14 January 2012. ^ a b Keene, D; Price, C; Shun-Shin, MJ; Francis, DP (18 July 2014). "Effect on cardiovascular risk of high density lipoprotein targeted drug treatments niacin, fibrates, and CETP inhibitors: meta-analysis of randomised controlled trials including 117,411 patients.". BMJ (Clinical research ed.) 349: g4379. ^ Bruckert E, Labreuche J, Amarenco P (June 2010). "Meta-analysis of the effect of nicotinic acid alone or in combination on cardiovascular events and atherosclerosis". Atherosclerosis 210 (2): 353–61. ^ Cantarella L, Gallifuoco A, Malandra A, Martínková L, Spera A, Cantarella M (2011). "High-yield continuous production of nicotinic acid via nitrile hydratase-amidase cascade reactions using cascade CSMRs". Enzyme and Microbial Technology 48 (4–5): 345–50. ^ Cox, Michael; Lehninger, Albert L; Nelson, David R. (2000). Lehninger principles of biochemistry. New York: Worth Publishers. ^ a b Wan P, Moat S, Anstey A (2011). "Pellagra: A review with emphasis on photosensitivity". The British journal of dermatology 164 (6): 1188–200. ^ Ishii N, Nishihara Y (1981). 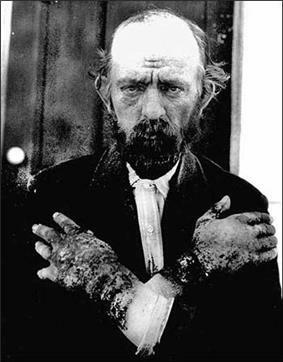 "Pellagra among chronic alcoholics: Clinical and pathological study of 20 necropsy cases". Journal of neurology, neurosurgery, and psychiatry 44 (3): 209–15. ^ Jaconello P (October 1992). "Niacin versus niacinamide". CMAJ 147 (7): 990. ^ Jacobson, EL (2007). "Niacin". ^ Jacob RA, Swendseid ME, McKee RW, Fu CS, Clemens RA (April 1989). "Biochemical markers for assessment of niacin status in young men: urinary and blood levels of niacin metabolites". J. Nutr. 119 (4): 591–8. ^ Pitsavas S, Andreou C, Bascialla F, Bozikas VP, Karavatos A (2004). "Pellagra encephalopathy following B-complex vitamin treatment without niacin". Int J Psychiatry Med 34 (1): 91–5. ^ a b c d Prakash R, Gandotra S, Singh LK, Das B, Lakra A (2008). "Rapid resolution of delusional parasitosis in pellagra with niacin augmentation therapy". General Hospital Psychiatry 30 (6): 581–4. ^ Bruckert E, Labreuche J, Amarenco P (2010). "Meta-analysis of the effect of nicotinic acid alone or in combination on cardiovascular events and atherosclerosis". Atherosclerosis 210 (2): 353–61. ^ Duggal JK, Singh M, Attri N, Singh PP, Ahmed N, Pahwa S, Molnar J, Singh S, Khosla S, Arora R (2010). "Effect of niacin therapy on cardiovascular outcomes in patients with coronary artery disease". Journal of cardiovascular pharmacology and therapeutics 15 (2): 158–66. ^ NCEP. (2002). "Third Report of the National Cholesterol Education Program (NCEP) Expert Panel on Detection, Evaluation, and Treatment of High Blood Cholesterol in Adults (Adult Treatment Panel III) final report." Circulation 106(25) 3143–3421. ^ McGovern ME (2005). "Taking aim at HDL-C. Raising levels to reduce cardiovascular risk". Postgrad Med 117 (4): 29–30, 33–5, 39 passim. ^ a b c d Keith Parker; Laurence Brunton; Goodman, Louis Sanford; Lazo, John S.; Gilman, Alfred (2006). Goodman & Gilman's the pharmacological basis of therapeutics. New York: McGraw-Hill. ^ Benyó Z, Gille A, Kero J, Csiky M, Suchánková MC, Nüsing RM, Moers A, Pfeffer K, Offermanns S (2005). "GPR109A (PUMA-G/HM74A) mediates nicotinic acid-induced flushing". The Journal of Clinical Investigation 115 (12): 3634–40. ^ Benyó Z, Gille A, Bennett CL, Clausen BE, Offermanns S (2006). "Nicotinic acid-induced flushing is mediated by activation of epidermal langerhans cells". Molecular Pharmacology 70 (6): 1844–9. ^ Hanson J, Gille A, Zwykiel S, Lukasova M, Clausen BE, Ahmed K, Tunaru S, Wirth A, Offermanns S (2010). "Nicotinic acid- and monomethyl fumarate-induced flushing involves GPR109A expressed by keratinocytes and COX-2-dependent prostanoid formation in mice". The Journal of Clinical Investigation 120 (8): 2910–9. ^ Maciejewski-Lenoir D, Richman JG, Hakak Y, Gaidarov I, Behan DP, Connolly DT (2006). "Langerhans cells release prostaglandin D2 in response to nicotinic acid". The Journal of investigative dermatology 126 (12): 2637–46. ^ Kamanna VS, Kashyap ML (2008). "Mechanism of action of niacin". The American journal of cardiology 101 (8A): 20B–26B. ^ "Guidelines for Niacin Therapy For the Treatment of Elevated Lipoprotein a (Lpa)". ^ Katzung, Bertram G. (2006). Basic and clinical pharmacology. New York: McGraw-Hill Medical Publishing Division. ^ Barter, P (2006). "Options for therapeutic intervention: How effective are the different agents?". European Heart Journal Supplements 8 (F): F47–F53. ^ Chapman MJ, Assmann G, Fruchart JC, Shepherd J, Sirtori C (2004). "Raising high-density lipoprotein cholesterol with reduction of cardiovascular risk: the role of nicotinic acid—a position paper developed by the European Consensus Panel on HDL-C". Curr Med Res Opin 20 (8): 1253–68. ^ a b Papaliodis D, Boucher W, Kempuraj D, Michaelian M, Wolfberg A, House M, Theoharides TC (December 2008). "Niacin-induced "Flush" Involves Release of Prostaglandin D2 from Mast Cells and Serotonin from Platelets: Evidence from Human Cells in Vitro and an Animal Model". J Pharmacol Exp Ther 327 (3): 665–72. ^ a b Gille A, Bodor ET, Ahmed K, Offermanns S (2008). "Nicotinic acid: Pharmacological effects and mechanisms of action". Annual review of pharmacology and toxicology 48: 79–106. ^ Rader JI, Calvert RJ, Hathcock JN (January 1992). "Hepatic toxicity of unmodified and time-release preparations of niacin". The American Journal of Medicine 92 (1): 77–81. ^ Capuzzi DM, Morgan JM, Brusco OA, Intenzo CM (2000). "Niacin dosing: relationship to benefits and adverse effects". Curr Atheroscler Rep 2 (1): 64–71. ^ Mittal MK, Florin T, Perrone J, Delgado JH, Osterhoudt KC (2007). "Toxicity from the use of niacin to beat urine drug screening". Ann Emerg Med 50 (5): 587–90. ^ Gass JD (2003). "Nicotinic acid maculopathy". Retina (Philadelphia, Pa.) 23 (6 Suppl): 500–10. ^ Soga T, Kamohara M, Takasaki J, Matsumoto S, Saito T, Ohishi T, Hiyama H, Matsuo A, Matsushime H, Furuichi K (2003). "Molecular identification of nicotinic acid receptor". Biochemical and Biophysical Research Communications 303 (1): 364–9. ^ Wise A, Foord SM, Fraser NJ, Barnes AA, Elshourbagy N, Eilert M, Ignar DM, Murdock PR, Steplewski K, Green A, Brown AJ, Dowell SJ, Szekeres PG, Hassall DG, Marshall FH, Wilson S, Pike NB (2003). "Molecular identification of high and low affinity receptors for nicotinic acid". The Journal of Biological Chemistry 278 (11): 9869–74. ^ Wanders D, Judd RL (2011). "Future of GPR109A agonists in the treatment of dyslipidaemia". Diabetes, obesity & metabolism 13 (8): 685–91. ^ Hernandez C, Molusky M, Li Y, Li S, Lin JD (2010). "Regulation of hepatic ApoC3 expression by PGC-1β mediates hypolipidemic effect of nicotinic acid". Cell metabolism 12 (4): 411–9. ^ a b c d Villines TC, Kim AS, Gore RS, Taylor AJ (2012). "Niacin: The evidence, clinical use, and future directions". Current atherosclerosis reports 14 (1): 49–59. ^ Rubic T, Trottmann M, Lorenz RL (2004). "Stimulation of CD36 and the key effector of reverse cholesterol transport ATP-binding cassette A1 in monocytoid cells by niacin". Biochemical pharmacology 67 (3): 411–9. ^ Barter P, Gotto AM, LaRosa JC, Maroni J, Szarek M, Grundy SM, Kastelein JJ, Bittner V, Fruchart JC (2007). "HDL cholesterol, very low levels of LDL cholesterol, and cardiovascular events". The New England Journal of Medicine 357 (13): 1301–10. ^ Jafri H, Alsheikh-Ali AA, Karas RH (2010). "Meta-analysis: Statin therapy does not alter the association between low levels of high-density lipoprotein cholesterol and increased cardiovascular risk". Annals of internal medicine 153 (12): 800–8. ^ Wu BJ, Yan L, Charlton F, Witting P, Barter PJ, Rye KA (2010). "Evidence that niacin inhibits acute vascular inflammation and improves endothelial dysfunction independent of changes in plasma lipids". Arteriosclerosis, thrombosis, and vascular biology 30 (5): 968–75. ^ Gustafson B (2010). "Adipose tissue, inflammation and atherosclerosis". Journal of atherosclerosis and thrombosis 17 (4): 332–41. ^ F. Aguilar, U.R. Charrondiere, B. Dusemund, P. Galtier, J. Gilbert, D.M. Gott, S. Grilli, R. Guertler, G.E.N. Kass, J. Koenig, C. Lambré, J-C. Larsen, J-C. Leblanc, A. Mortensen, D. Parent-Massin, I. Pratt, I.M.C.M. Rietjens, I. Stankovic, P. Tobback, T. Verguieva, R.A. Woutersen (2009). "Inositol hexanicotinate (inositol hexaniacinate) as a source of niacin (vitamin B3) added for nutritional purposes in food supplements". The EFSA Journal 949: 1–20. ^ Knip M, Douek IF, Moore WP, Gillmor HA, McLean AE, Bingley PJ, Gale EA (2000). "Safety of high-dose nicotinamide: a review". Diabetologia 43 (11): 1337–45. ^ Taheri, R (15 January 2003). "No-Flush Niacin for the Treatment of Hyperlipidemia". ^ Kruse W, Kruse W, Raetzer H, Heuck CC, Oster P, Schellenberg B, Schlierf G (1979). "Nocturnal inhibition of lipolysis in man by nicotinic acid and derivatives". European Journal of Clinical Pharmacology 16 (1): 11–15. ^ Meyers CD, Carr MC, Park S, Brunzell JD (2003). "Varying cost and free nicotinic acid content in over-the-counter niacin preparations for dyslipidemia". Annals of Internal Medicine 139 (12): 996–1002. ^ Benjó AM, Maranhão RC, Coimbra SR, Andrade AC, Favarato D, Molina MS, Brandizzi LI, da Luz PL (2006). "Accumulation of chylomicron remnants and impaired vascular reactivity occur in subjects with isolated low HDL cholesterol: effects of niacin treatment". Atherosclerosis 187 (1): 116–122. ^ Diet & Fitness today. "Niacin in beer". ^ "Vegemite – Nutritional information". Retrieved 6 November 2013. ^ "Marmite – Nutritional information". Retrieved 19 November 2014. ^ "Food Data Chart – Niacin". Retrieved 7 September 2012. ^ Lai E, De Lepeleire I, Crumley TM, Liu F, Wenning LA, Michiels N, Vets E, O'Neill G, Wagner JA, Gottesdiener K (2007). "Suppression of niacin-induced vasodilation with an antagonist to prostaglandin D2 receptor subtype 1". Clinical pharmacology and therapeutics 81 (6): 849–57. ^ Paolini JF, Bays HE, Ballantyne CM, Davidson M, Pasternak R, Maccubbin D, Norquist JM, Lai E, Waters MG, Kuznetsova O, Sisk CM, Mitchel YB (November 2008). "Extended-release niacin/laropiprant: reducing niacin-induced flushing to better realize the benefit of niacin in improving cardiovascular risk factors". Cardiol Clin 26 (4): 547–60. ^ Kamanna VS, Vo A, Kashyap ML (2008). "Nicotinic acid: Recent developments". Current Opinion in Cardiology 23 (4): 393–8. .
^ "Merck begins overseas recall of HDL cholesterol drug". Reuters. 11 January 2013. ^ Norris RB (2006). ""Flush-free niacin": Dietary supplement may be "benefit-free"". Preventive cardiology 9 (1): 64–5. ^ Weidel, H (1873). "Zur Kenntniss des Nicotins". ^ Elvehjem CA, Madden RJ, Strongandd FM, Woolley DW (1938). "The isolation and identification of the anti-blacktongue factor J" (PDF). J. Biol. Chem. 123 (1): 137–149. ^ Laguna J, Carpenter KJ (September 1951). "Raw versus processed corn in niacin-deficient diets". J. Nutr. 45 (1): 21–8. ^ Altschul R, Hoffer A, Stephen JD (1955). "Influence of nicotinic acid on serum cholesterol in man". Archives of biochemistry and biophysics 54 (2): 558–9. On April 22, 2014, Pennsylvania State University researchers working with NASA at the Goddard Astrobiology Analytical Laboratory reported of finding niacin within eight CM-2 type carbonaceous chondrite meteorites. The meteorite’s vitamin B3 levels ranged from 30–600 parts per billion, the study reports. 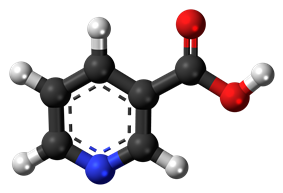 Related molecules discovered in the meteorites include pyridine carboxylic acids and pyridine dicarboxylic acids. In 1955, Altschul and colleagues described niacin as having a lipid lowering property. Niacin is the oldest lipid lowering drug. Over-the counter niacin dietary supplements generally lack the safety and efficacy data required for FDA regulatory approval. Some “no flush” types, such as inositol hexanicotinate contain convertible niacin compounds, but have little clinical efficacy in reducing cholesterol levels. “Slow release” varieties have higher hepatotoxic activity, hence non-prescription niacin is not recommended due to potential harm. Many preparations of niacin are available over-the-counter as dietary supplements. Immediate release niacin is effective at lowering cholesterol levels, and has minimal hepatotoxic side effects due to its rapid elimination from the body. However, it has the main drawback of causing strong vasodilation side effects with sensations of flushing and skin tingling that can be unpleasant to many patients. Non-prescription extended release niacin, such as Endur-acin, which uses a wax matrix to delay release is available as well. A prescription extended release niacin, Niaspan, has a film coating that delays release of the niacin, resulting in an absorption over a period of 8–12 hours. The extended release formulations generally reduce vasodilation and flushing side effects, but increase the risk of hepatotoxicity compared to the immediate release forms. Niacin is found in variety of foods, including liver, chicken, beef, fish, cereal, peanuts, and legumes, and is also synthesized from tryptophan, an essential amino acid found in most forms of protein. It reduces secondary outcomes associated with atherosclerosis, such as low density lipoprotein cholesterol (LDL), very low-density lipoprotein cholesterol (VLDL-C), and triglycerides (TG), but increases high density lipoprotein cholesterol (HDL). Despite the importance of other cardiovascular risk factors, high HDL was associated with fewer cardiovascular events independent of LDL reduction. Other effects include anti-thrombotic and vascular inflammation, improving endothelial function, and plaque stability. Adipokines are the adipocytes’ produced mediators. Some adipokines such as tumor necrosis factor (TNF)-a, interleukins and chemokines, have pro-inflammatory effect and some others such as adiponectin have anti-inflammatory effect that regulates inflammatory process, decrease vascular progression and atherosclerosis. Niacin therapeutic effect is mostly through its binding to liver, kidney, heart or intestine. NIACR1 inhibits cyclic adenosine monophosphate (cAMP) production and thus fat breakdown in adipose tissue and free fatty acids available for liver to produce triglycerides and very-low-density lipoproteins (VLDL) and consequently low-density lipoprotein (LDL) or "bad" cholesterol. Decrease in free fatty acids also suppress hepatic expression of apolipoprotein C3 (APOC3) and PPARg coactivator-1b (PGC-1b) thus increase VLDL turn over and reduce its production. It also inhibits diacylglycerol acyltransferase-2 (important hepatic TG synthesis). Although high doses of niacin may elevate blood sugar, thereby worsening diabetes mellitus, recent studies show the actual effect on blood sugar to be only 5–10%. Patients with diabetes who continued to take anti-diabetes drugs containing niacin did not experience major blood glucose changes. Thus overall, niacin continues to be recommended as a drug for preventing cardiovascular disease in patients with diabetes. Hepatotoxicity is another side effect of niacin. 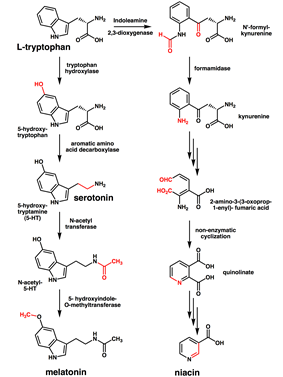 This is possibly related to metabolism via amidation resulting in NAD production. The time-release form has a lower therapeutic index for lowering serum lipids relative to this form of toxicity. Flushing usually lasts for about 15 to 30 minutes, though it can sometimes last up to two hours. It is sometimes accompanied by a prickly or itching sensation, in particular, in areas covered by clothing. Flushing is mediated by prostaglandin E2 and D2 due to GPR109A activation of epidermal Langerhans cells and keratinocytes. Langerhans cells use cyclooxygenase type 1 (COX-1) for PGE2 production and are more responsible for acute flushing while keratinocytes are COX-2 dependent and are in active continued vaso-dilation. To reduce flushing many studies focused on altering or blocking the prostaglandin mediated pathway. This effect is mediated by GPR109A-mediated prostaglandin release from the Langerhans cells of the skin and can be blocked by taking 300 mg of aspirin half an hour before taking niacin, by taking one tablet of ibuprofen per day or by co-administering the prostaglandin receptor antagonist laropiprant. Taking the niacin with meals also helps reduce this side effect. After several weeks of a consistent dose, most patients no longer flush. Slow- or "sustained"-release forms of niacin have been developed to lessen these side effects. One study showed the incidence of flushing was significantly lower with a sustained release formulation though doses above 2 g per day have been associated with liver damage, in particular, with slow-release formulations. Flushing is often thought to involve histamine, but histamine has been shown not to be involved in the reaction. Prostaglandin (PGD2) is the primary cause of the flushing reaction, with serotonin appearing to have a secondary role in this reaction. Pharmacological doses of niacin (1.5 – 6 g per day) lead to side effects that can include dermatological conditions such as skin flushing and itching, dry skin, and skin rashes including eczema exacerbation and acanthosis nigricans. Some of these symptoms are generally related to niacin's role as the rate limiting cofactor in the histidine decarboxylase enzyme which converts l-histidine into histamine. H1 and H2 receptor mediated histamine is metabolized via a sequence of mono (or di-) amine oxidase and COMT into methylhistamine which is then conjugated through the liver's CYP450 pathways. Persistent flushing and other symptoms may indicate deficiencies in one or more of the cofactors responsible for this enzymatic cascade. Gastrointestinal complaints, such as dyspepsia (indigestion), nausea and liver toxicity fulminant hepatic failure, have also been reported. Side effects of hyperglycemia, cardiac arrhythmias and "birth defects in experimental animals" have also been reported. The National Cholesterol Education Program (NCEP) in 2002 recommended niacin alone for cardiovascular and atherogenic dyslipidemia in mild or normal LDL levels or in combination for higher LDL levels. By lowering VLDL levels, niacin also increases the level of high-density lipoprotein (HDL) or "good" cholesterol in blood, and therefore it is sometimes prescribed for people with low HDL, who are also at high risk of a heart attack. A 2014 review of niacin did not find that it affected either cardiovascular disease or risk of death in those already taking a statin. Niacin alone appears to reduce the risk of cardiovascular disease. Severe deficiency of niacin in the diet causes the disease pellagra, which is characterized by diarrhea, dermatitis, and dementia, as well as “Casal's necklace” lesions on the lower neck, hyperpigmentation, thickening of the skin, inflammation of the mouth and tongue, digestive disturbances, amnesia, delirium, and eventually death, if left untreated. Common psychiatric symptoms of niacin deficiency include irritability, poor concentration, anxiety, fatigue, restlessness, apathy, and depression. Studies have indicated that, in patients with alcoholic pellagra, niacin deficiency may be an important factor influencing both the onset and severity of this condition. Patients with alcoholism typically experience increased intestinal permeability, leading to negative health outcomes. At present, niacin deficiency is sometimes seen in developed countries, and it is usually apparent in conditions of poverty, malnutrition, and chronic alcoholism. It also tends to occur in areas where people eat maize (corn) as a staple food, since it is the only grain low in digestible niacin. A special cooking technique called nixtamalization is needed to increase the bioavailability of niacin during maize meal/flour production. One recommended daily allowance of niacin is 2–12 mg/day for children, 14 mg/day for women, 16 mg/day for men, and 18 mg/day for pregnant or breast-feeding women. Tolerable upper intake levels (UL) for adult men and women is considered to be 35 mg/day by the Dietary Reference Intake system to avoid flushing. In general, niacin status is tested through urinary biomarkers, which are believed to be more reliable than plasma levels.